The scales discussed in Chap. 2 — the Hamilton Anxiety Scale (HAS), Hamilton Depression Scale (HDS), Melancholia Scale (MES), Mania Scale (MAS), and Brief Psychiatric Rating Scale (BPRS) — have been selected because research has shown them relevant for assessing changes in the patient’s condition during the treatment, by psychiatrists all over the world. These are not diagnostic scales. 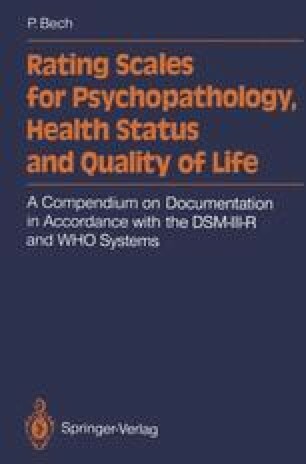 Their main function in measuring the severity of psychopathology is to indicate when treatment is required, and when treatment can be discontinued. The oldest scales (HAS, HDS and BPRS) were originally published without sufficient Likert item criteria. Therefore many different versions of these scales exist The most frequently used versions, at least outside Scandinavia, are the so-called HAM-A (Hamilton Anxiety Scale), HAM-D (Hamilton Depression Scale) and the BPRS with seven anchored items, which have been published in the American (Guy 1976) and the German systems (CIPS 1981). The manuals in these systems are, however, unacceptable as they do not fulfil the Likert criteria.